The data on this site is gathered from open sources. This site makes no warranties, express or implied, regarding these values, fitness for a particular purpose, availability, title, non-infringement and the performance of this site. These values and dates are believed to be reliable but we do not guarantee their accuracy, completeness or correctness. Rounding or software errors may occur on this site. This statement outlines the data collection and privacy related practices of http://www.dailymetalprice.com, referred to as the "Site" for the remainder of this statement. This Site contains links to third party websites and is not responsible for the contents of those websites or their privacy practices. 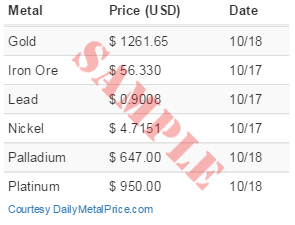 The Site may request registration information including e-mail addresses and other personal and preference data from website owners interested in putting the widgets created by http://www.dailymetalprice.com on their website. Registered users may be contacted by us for the purpose of administering their account and with news announcing features, changes or upgrades available to account holders. Registered users may be occasionally be contacted by us with marketing offers that may be of interest to them, either from us or from our marketing partners. This Site may use temporary "cookies" to gather statistical and demographic data. This Site logs the activity of visitors on the Site. This data provides statistical information, which can be used for security, technical and marketing purposes. Updated daily. Spot prices on 16 base and precious metals PLUS charts and historical prices going back as far as January 2000. 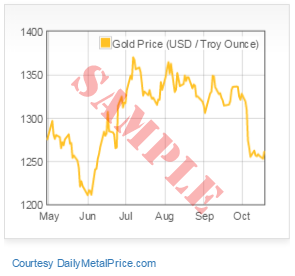 Get free metal price charts & widgets for your website.